Custom made pancake gun holsters made for the firearms enthusiasts. Each holster is hand crafted with only the top of the line materials. Heirloom quality holsters that can be passed down from generation to generation. It is a simple design that gives great support to your firearm while at the same time providing assured comfort and security. Most pancake holsters are designed with a thumb break to provide great retention while it is nestled comfortably against your body. Attachment points at your gun belt provide for easy access and flexibility of wear. These holsters can be made of exotic leathers, cow and horse hide and may come in a multitude of colors to fit your fashion. These are great to carry your favorite snub nose revolver or other side arm of choice. 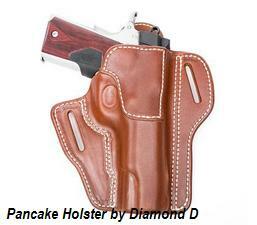 The pancake holster is a great choice for both small frame and large frame revolvers.